Digital asset management harnesses data and creates a learning organisation that can thrive in any business climate. In 2014, the price per barrel of oil dropped by 50%. This price reduction rippled throughout the industry, leaving owner-operators in a difficult market. Oil and gas majors cancelled projects and slashed their capital budgets. Ultimately, the companies had two options: cut back and hope that the downturn ended soon or retool and look for opportunities. Today, those organisations who want to retool need to adapt their focus. Among the many challenges faced when adapting is good asset data management. Oftentimes, asset data is held in different places, such as engineering design systems, asset registers, marked-up PDFs and drawings and unstructured spreadsheets. The data can be inconsistent and incomplete, or is often out-of-date across these various locations. Using bad information results in accidents, failures, or shutdowns. Unlike turnarounds, shutdowns are unexpected and the process of verifying the information can take days before the plant can start back up. Workers need to go through the data across all assets, looking for where the problem occurred and sorting out all the discrepancies. During this time, assets cannot run, leading to loss of resource hours, production, and profit. These unexpected shutdowns can severely affect an organisation during any type of business climate, but it can be especially detrimental amid a difficult market. To overcome this challenge, oil and gas owner-operators need accurate, consistent, and complete engineering information about their assets. Otherwise, they face the risk of failures that could have catastrophic consequences, which are not an option when the stakes are high. Digital asset management applications can provide both data and context, federated across multiple data sources, giving users the trusted engineering information needed when making decisions across the lifecycle of oil and gas assets. Owner-operators, and anyone making decisions about an asset, benefit from a data environment that connects design, engineering, and asset information to build a complete view. 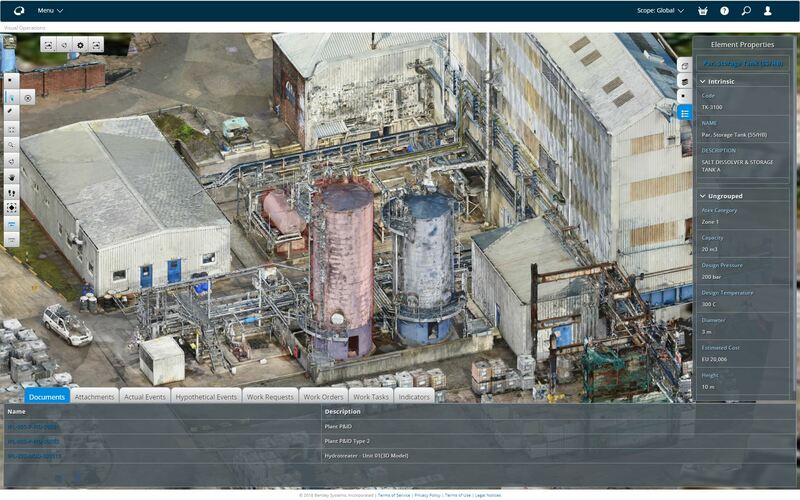 This connectivity, this digitalisation of information, enables better decisions, better performing assets and projects, and improved collaboration from capital planning through proactive asset maintenance to decommissioning. Ultimately, it leads to greater returns on investment for operations, inspections, maintenance, and construction of oil and gas assets. Applications help mitigate risk, increase operational efficiency, and ensure regulatory compliance by leveraging a connected data environment to facilitate the interoperation of multiple data sources and provide a common view of data. This federated source of trusted information ensures that when it comes time to make decision about fixing or changing an asset, the information is readily available and accurate for users. Over the years, many owner-operators in the oil and gas industry have begun digitalising their asset management process. In 2014, QGC wanted to provide cleaner hydrocarbon energy in the form of liquified natural gas (LNG) with its Queensland Curtis LNG project. Located in North East Queensland, QGC is one of Australia’s leading natural gas producers with a focus on developing Queensland’s onshore gas reserves. Its operations include more than 2,600 production wells, 24 field compression stations, six central processing plants, two water treatment plants, and the two-train LNG export facility. At the LNG facility, over 1 million items of equipment are spread over 4,500 square kilometres, each item of equipment equaling up to 20 data attributes that included related assets, documents, and data. QGC needed a way to manage, track, and maintain these assets for ongoing operations, so the project team developed a master tag register and engineering warehouse using eB Information Manager, now called AssetWise Asset Lifecycle Information Management (ALIM). AssetWise ALIM helped consolidate more than 20 million pieces of information, converting engineering design data into iModel format for easier access and improved collaboration among team members. Users could identify every location where an item was installed and had a complete history of every item on demand in the warehouse. Ultimately, the digital asset management system helped provide transparency and traceability in data ownership, organising the information and making it accessible for all parties. These benefits are being realised across the oil and gas industry. At Suncor Energy (Suncor), its mission is to create energy for a better world. The organisation values safety above all else and was looking for a way to make decisions that put safety and integrity first. The project team at Suncor’s Edmonton Refinery in Alberta, Canada wanted an Information Plant (IP) that integrated the facility’s technical data, engineering resource planning information, and documents into one reliable system. The team also used what is now called AssetWise ALIM, to create a standards-based technical data warehouse that would support automation and total lifecycle asset information. The IP improved and supported daily operations, maintenance, and business decisions. With the digital asset management software, the IP reduced the time required by users to find information and overall safety risks. One centralised location of information made it easier for users to look at the facts and make better decisions. This increase in efficiency saved Suncor about CAN$ 5.7 million in the first year of implementation. Suncor also predicts estimated annual savings of CAN$ 1.6 million, realising a total return on investment within five years of implementation. Users could easily navigate the system with consistent and integrated tools, processes, and information. More importantly, however, the ability to continuously monitor information improved information quality and reliability at the refinery. Finally, another example of organisations realising the benefits of digital asset management is with Volgogradnefteproekt’s as-built 3D information model for the Vladimir Filanovsky offshore field. Located about 50 kilometres off the northern shore of the Caspian Sea, the client wanted 2D and 3D documentation for each of the seven platforms, as well as consolidation of the engineering data to create a unified, as-built 3D digital model of the field. Volgogradnefteproekt used AssetWise ALIM to consolidate the engineering data from the different contractors, each of whom were using a variety of different engineering applications from different software vendors. Using a digital asset management system cut search and data exchange time by 30 and 70%, respectively. Volgogradnefteproekt also saw document coordination increase by 25%. The team not only completed the project in less time but also delivered higher quality documentation. The accurate construction documents resulted in further savings as contractors performed less rework. Encouraged by the positive results achieved on this project, the owner plans to implement the digital asset management platform on future field development projects to attain similar goals for information asset management and documentation quality. For these members of the oil and gas industry, digital asset management systems were important for making asset decisions. Traditional and non-digital approaches to managing assets relied on manual, controlled issues of data and drawings, not considering how the information should be managed across the entire lifecycle. Now, these management systems provide an integrated information management environment based on a connected data environment that improves the quality, integrity, and relevance of asset data across all project phases. Digital asset management systems, whether using AssetWise or another application, should show the engineering and technical information of an asset, not just the production data, and span multiple data sources. It should use the data to improve visibility while also highlighting and helping manage change in an asset. Digital asset management systems are helping many companies in the oil and gas industry, with varying levels of digital maturity, benefit from going digital. Applications like AssetWise and AssetWise ALIM provide easier access to critical asset information, and help organisations move to reliability-centred design to improve asset reliability. They offer visibility into the path of project construction and improve handover, as well as support operational decision making with operational analytics. They give owner-operators the services needed to help assess their own digital maturity and how to leverage existing investments in digital information. As seen through the examples of QGC’s master tag register and engineering warehouse, Suncor Energy’s IP, and Volgogradnefteproekt’s as-built 3D information model, successful industry players seek out new ways to leverage their expertise. They rely on digital assets to inform a deeper understanding of the physical asset. Going digital can help create learning organisations that thrive in any business climate, even a tumultuous one.